Safe & Secure Shopping. Gear & Advice You Can Trust. 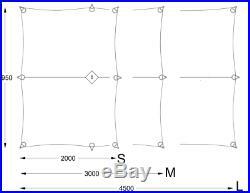 Wilderness Equipment Large Ultralight Overhang Tarp Shelter. Add to Favourite Sellers. Engineered tarps for the fast and light. This ultra-light range of Overhangs uses 30 denier high-tenacity nylon 66 fabric with a silicone elastomer coating on BOTH sides. The high relative strength and natural elasticity of this fabric make it an ideal choice for these tensile canopies. The silicone takes care of the UV exposure. Don t be fooled, these simple looking products incorporate an uncommon level of sophisticated design and construction detail to make them the best pitching and strongest available. Our trade-mark tear-drop guy attachment is now years old. We devised it, not as a universal guy cord pouch but because simple triangular reinforcing patches build-in new weaknesses. There is hardly a trip that we don t take an Overhang along – when we didn t, we usually wished we had! They are so useful during stops en route and on wet lay days. Looking at the medium size, at roughly 3 metres square and just 700 grams you can easily see why. Comes with guy lines, and can also make a groundsheet. 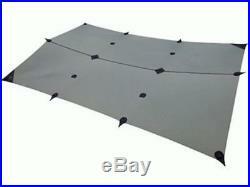 30 denier, 1500mm nylon 66 ripstop with silicone elastomer coating both sides. Unique, reinforced guy points with integral pockets. 3m guy lines supplied on corners, 2m on sides. Colour: Eucalyptus Green / Black Trim. Sizes: large – 4.5m x 2.95m wide. This is the Overhang for Outdoor Education groups and commercial operators. It’s also the one if you going lightweight with all the family or a group of friends. The large Overhang makes an ideal cooking or field meeting shelter. It’s big enough to work effectively pitched up a little higher. A favorite in Tasmania. In use images below. Much more info about the Lightweight Overhangs. All sizes in the Overhang range feature a reinforced ridge seam and simple, fully-catenary-cut fabric panels either side of this main seam. The guys attach to the tarp fabric body via our unique design, tear-drop shaped, reinforced, double-layer patches that incorporate pockets into which guy cords can be stashed. These patches distribute stress into the fabric panels better than any other simple reinforcement system. You can have confidence that your Overhang will resist high winds and, thanks to the guy cord pocket feature, it won’t come out of its stuff sac a hopeless tangle of cords! The choice of high-tenacity, 30d nylon 66 ripstop with silicone elastomer coatings on both faces gives these ultra-light Overhangs the best possible performance and durability, all at reduced weight. The silicone coatings improve repellency, snow shedding and UV resistance while maintaining much of the base fabric’s tear strength. The energy absorbing elasticity of the nylon, combined with the strong guy attachment system give these light-weight tarps excellent performance in strong wind. Contrary to what might be expected, this lighter-weight fabric option presents no compromise to the life-expectancy of a properly cared for and maintained shelter. Choose this fabric option if every gram counts. Just so you know, it is not possible to factory tape seal onto a silicone elastomer coating. No hot-melt adhesive sticks. It is possible that some water may wick through the ridge seam and mid-panel guy attachment points. To be absolutely sure that your lightweight Overhang is waterproof at these places they must be hand sealed with liquid silicone sealant available from your specialist retailer. BEST BRANDS & PRICES. There are plenty of discount operators out there, but all you get from them is a cheap price and nothing else. If it’s just a price you’re after these guys might be for you, but if you’re after a service orientated company that won’t sell any other way then welcome to our store. Our cheap postal prices are live up to date prices with Australian post or courier. Our website is state of the art safe and secure, using a 128 bit SSL encryption protocol, the most secure online-shopping protocol. Unfortunately we DO NOT accept EFT direct deposit. If your item is a double swag or over 20kg parcel must be sent via courier and a daytime street address is required – NOT A PO BOX. Express and regular options are available for most items. All item prices include GST. All payments made payable direct to’Wild Earth. While all care is taken, any errors or omissions/variations in the item details are unintentional. Colours and images are for illustrative purposes and can vary so please specify when ordering if you require a specific colour otherwise an alternative colour may be sent depending on stock availability. WILD EARTH AUSTRALIA PTY LTD reserves the right to make changes to this site and these terms and conditions at any time. From time to time we may contact you about offers and new products. You can easily be removed by unsubscribing. For full terms and conditions please visit here. We are here to help you! The item “Wilderness Equipment Large Ultralight Overhang Tarp Shelter” is in sale since Wednesday, September 7, 2016. This item is in the category “Sporting Goods\Camping, Hiking\Tents & Canopies\Canopies & Shelters”. The seller is “wildearth-australia” and is located in gold coast. This item can be shipped to Australia, United States, United Kingdom, Japan, Canada, Germany, France, New Zealand. This entry was posted in wilderness and tagged equipment, large, overhang, shelter, tarp, ultralight, wilderness by admin. Bookmark the permalink.